Imagine this: a threshold- on this side is busy, stress, demand and pressure on the other is calm, friendly smiles, care and companionship. On this side is giving more than is easy, on the other is receiving in abundance. On this side is productivity and output, on the other is absorbing at a gentle pace. Each year I travel to Bali to offer, together with my friend and colleague Jacki Short, a 5-day Mindfulness and Creativity Retreat. In Bali, thresholds are an honoured transition. Each time a family member leaves or returns to the home compound- instead of walking through an ordinary gate, there are a few steps up, a step through an ornately decorated doorway and a few steps down the other side. A clear boundary is present between the sanctum of home, family and contribution to the immediate community and deities and the life of business, trade and commerce. Moving between these two significant parts of life is an embodied experience, a reminder, a pause. Think for a moment about your life: in your daily movements from here to there are you consciously aware of a transition from one part of your day to another? Do you halt even briefly to integrate the ‘what’s just been’ and make ready for the ‘what’s to come’? Do you create a threshold in our mind and body, a pause that allows our being to reset? Arriving in Bali you are almost immediately swept up in a daily rhythm of ritual. Each morning women place small hand-woven baskets with colourful offerings of blossoms, a sprinkle of cooked rice and a fragrant incense stick in the doorways and on the footpaths outside homes and shops, at the base of statues of Ganesh and other Hindu deities and in other significant places. Throughout the day there are set times for prayer and worship and countless rituals and ceremonies mark the Balinese year. In what way do you create space to honour what’s important and meaningful in your life? Do you take a moment to appreciate that which gives your life stability, purpose and joy? 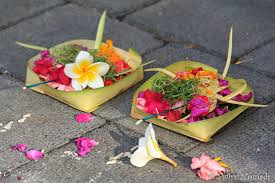 In March the whole of Bali falls silent for Nyepi, Balinese New Year ’s Day-imagine, 24 hours dedicated to rest, staying in, and keeping quiet to create a sanctuary for spiritual cleansing and renewal. A whole island wrapped in prayer and meditation. What do such sacred pauses offer your wellbeing of body, mind and soul? How do you build a true sanctuary into the never-ending stream of daily demands? What are retreats in your life to regain balance and equilibrium and fill your heart and mind with nourishment that truly satisfies? One thing is clear: unless you act, make conscious spaces to pause and tend to yourself life’s compost accumulates, obstructing clarity and calm and freedom of the heart and mind. Build a practice of meditation into your daily life-keep it simple and achievable. Be active: walk, dance, lift weights, do yoga, martial arts or pole dancing-but do not listen or watch anything while you are doing it. Just be present. Share what’s there- talk to family, friends, your therapist- show yourself, let them in. Put pauses into your day-remember the P-R-O (Pause-Relax-Open) practice-several times a day just. Make it a habit: for example whenever you sit down at your desk at work: P-R-O; each time you finish a phone call: P-R-O; at night when your child finally falls asleep: P-R-O; before you begin a meal: P-R-O. So many opportunities. Go on retreat. Once a year. Several times a year. Plan them. Commit. Put them in the diary. 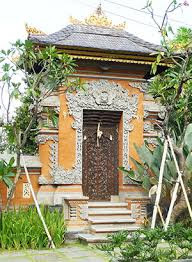 Jacki and I love our Bali Retreat and what it offers to participants. We believe in it because we have seen the transformation in people. We still have four places available for the retreat this August 5-10. Join us!